My husband and I first had Pignoli Cookies at an Italian Bakery in Manhattan, Venieros, when we still dating. It was a regular stop then, when we wanted a fail proof dessert after dinner- their expressos were pretty good too. We should probably visit one of these days with the kids too. It’s been years, maybe over 10, even. 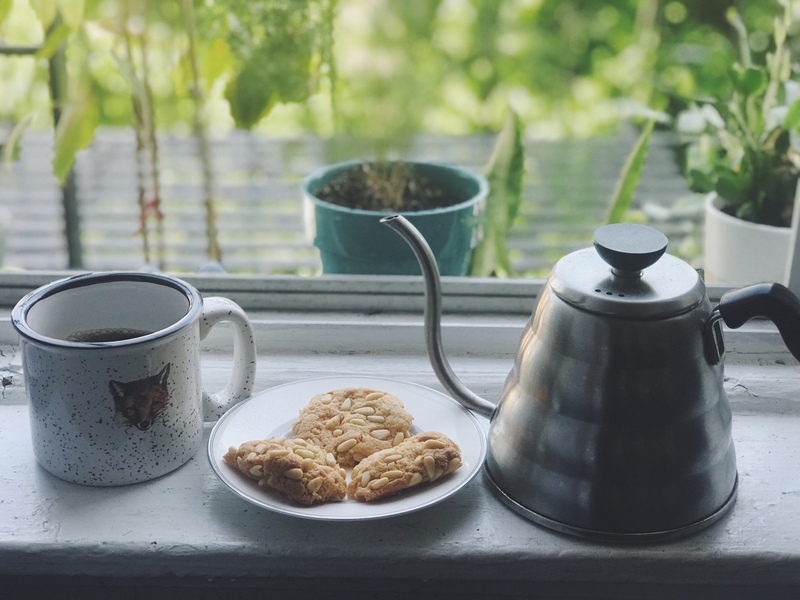 We’ve since got to enjoy Pignoli Cookies whenever we find out a bakery close to us sells them. 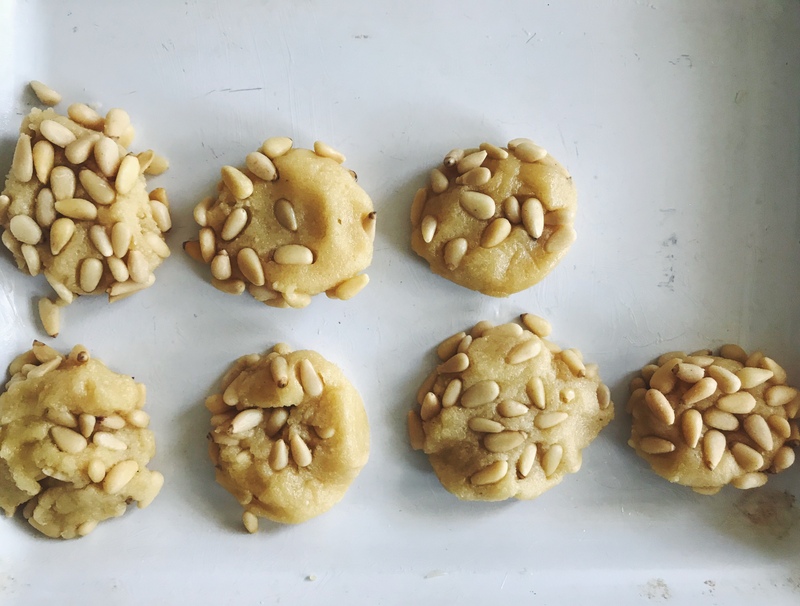 The fragrant aroma and flavor of the almonds and toasted pine nuts is a heavenly match. 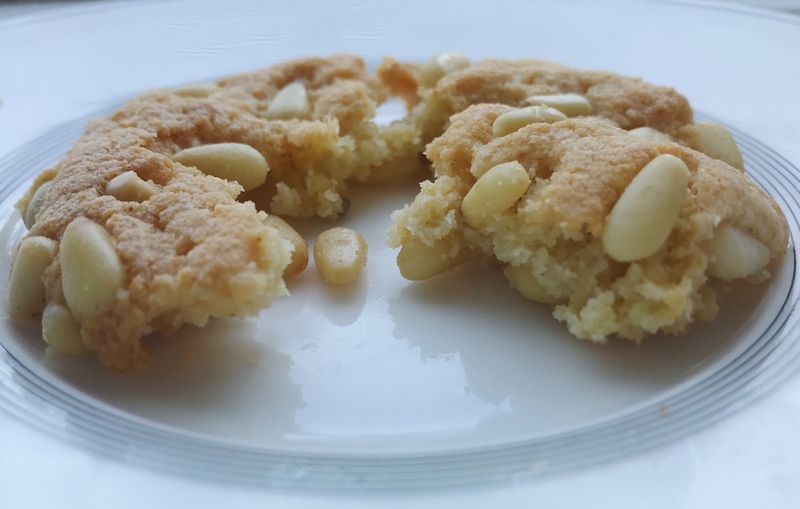 The perfect crisp exterior of the cookie crust and the perfect chewy interior is not too sticky that it gets stuck in your teeth, but crumbly and chewy from the melted almond paste and sugar mixture when you bake it. 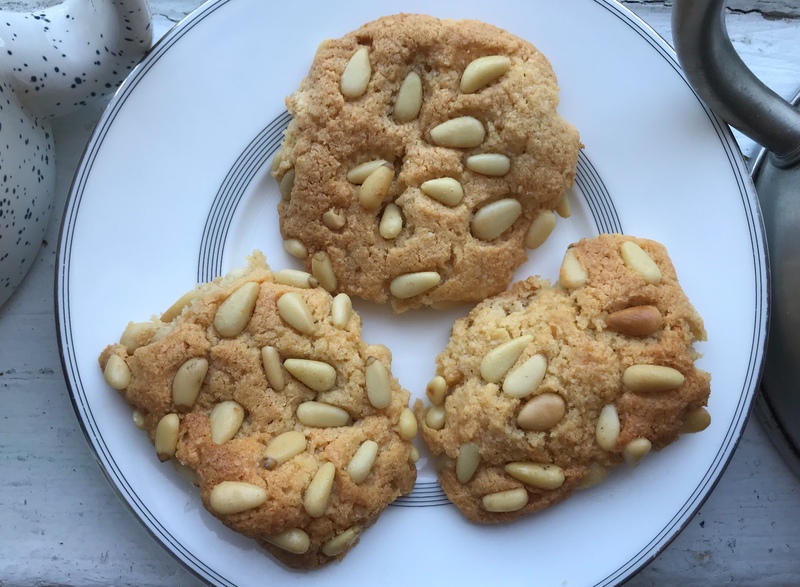 I guess you can say it taste like the denser version of shortbread cookies, but richer in flavor due to the almond paste; the generous amount pine nuts rolled onto every cookie add a perfect, even crunch to every bite. The texture reminds me of a crumblier version of a blondie brownie, but taste like buttery shortbread cookies . I adapted the recipe from Pasta Based. 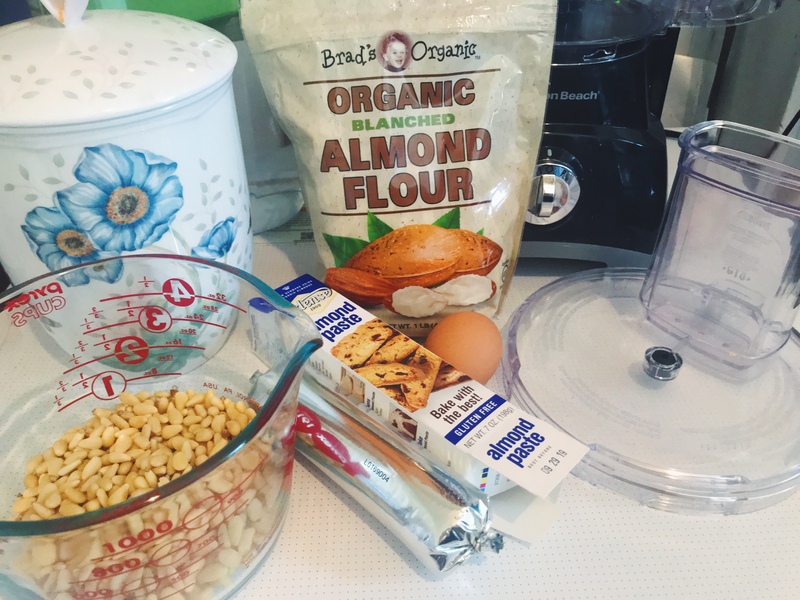 This recipe was actually vegan and while I usually turn non-vegan recipes into vegan because of my eldest one and her many food allergies ; I didn’t this time because I didn’t have the Earth Balance Butter sticks. Whenever I decide to a recipe, know that I must’ve explored between 3 and 5 before I decide which one I liked best and do a cross reference on the commonalities in the ingredients list, amount of each ingredient and method before deciding how to adjust it to my liking. 1. Preheat oven to 325°F and either line a baking sheet with parchment paper or butter it. 2. 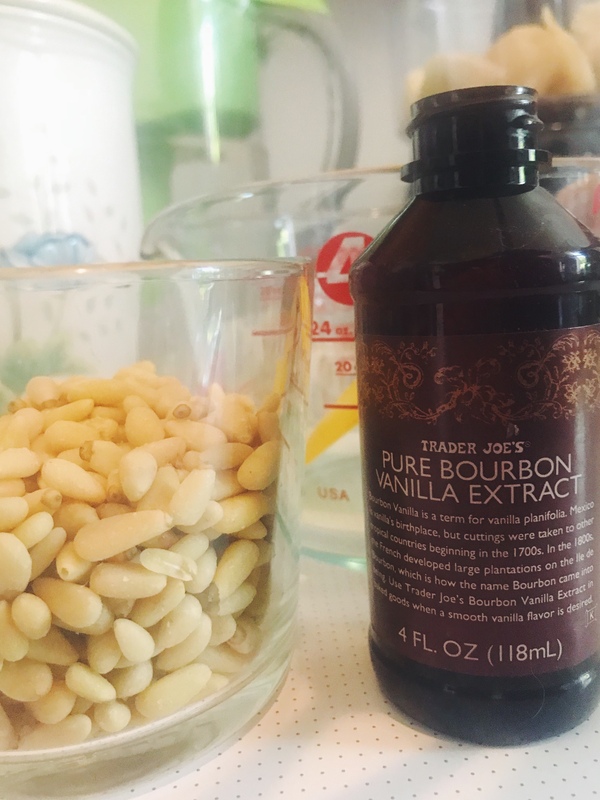 Using a food processor, mix almond paste, butter, sugar and vanilla bourbon extract (I would imagine almond, vanilla or even orange, lemon or any extract could work). 3. Add in the egg, almond flour and baking powder to the batter and mix thoroughly. 4. Form a dough ball to the size of a munchkin. 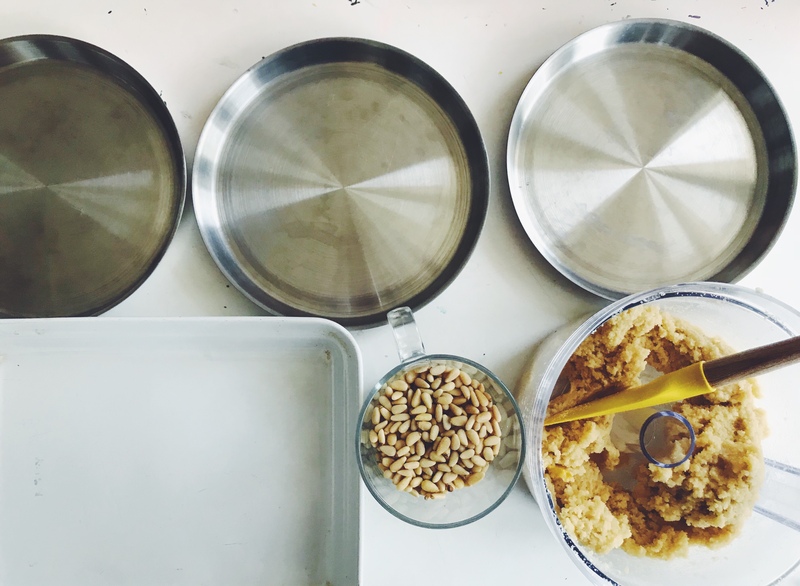 4	Pour pine nuts onto a bowl or plate. 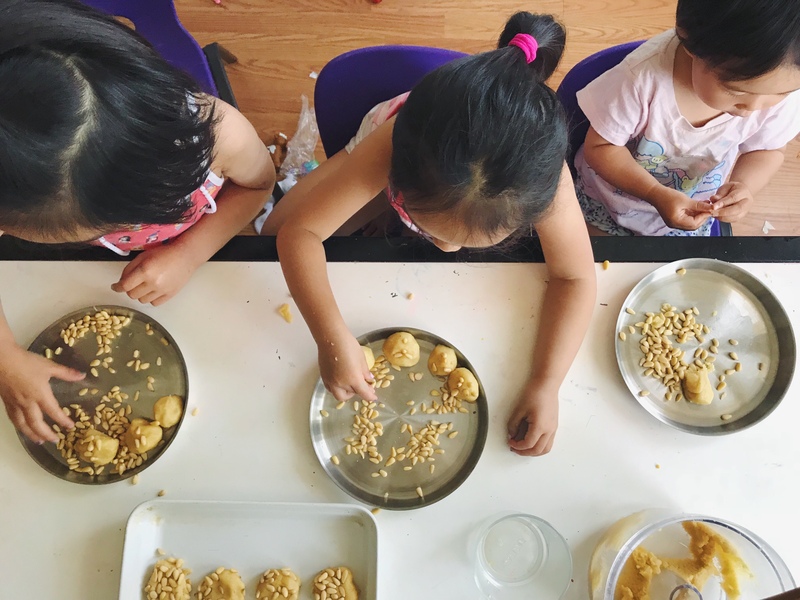 5	Roll the ball into the pine nuts, gently pushing it down to flatten a little bit until the whole thing is evenly covered in pine nuts. 6	Place on baking tray or sheet, ensuring there is at least say, 2 inches between each cookie (I don’t bake cookies too much so I didn’t leave enough space, but thankfully, they separated well after I took it out from the oven). 7. Bake at 325°F between 15-20 minutes. I took them out as soon as I saw that most of the edges turned light brown. You can leave them 2-4 minutes longer if you don’t see any brown yet, or simply if you like them on the crispier side. My first batch were more pieces and closer together so it took 20 minutes exact. The second batch was better spaced apart and it took about 15 minutes. **Note: I overcooked my last batch and they were super crunchy all around. But the next day, they were were much softer. I’m thinking it was probably the humidity today. 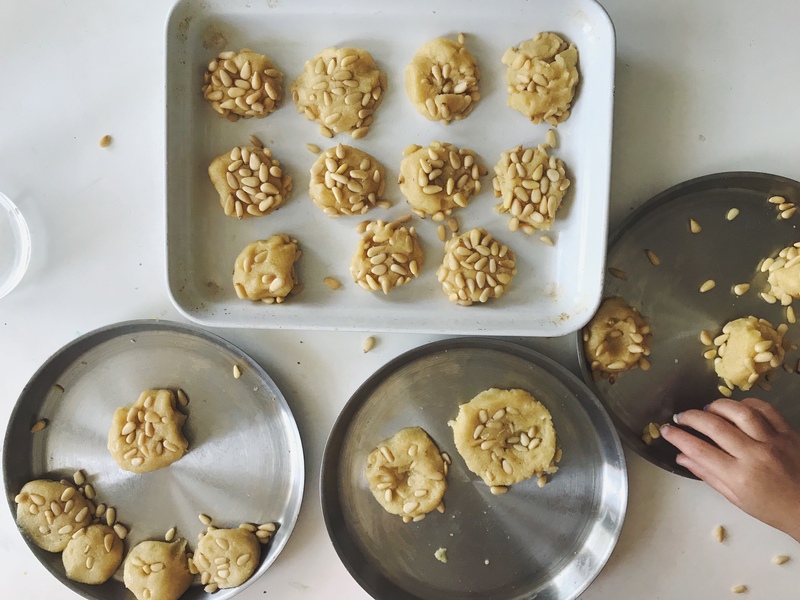 I’m curious, how many of you ever had Pignoli Cookies before? How would you describe the flavor and texture? We crumbled the leftover cookies onto a mountain of ice cream, along with the extra toasted pine nuts that fell off while baking and rainbow sprinkles for my husband’s birthday the next day.